Check for fake IDs, Credit Cards, & Counterfeits! 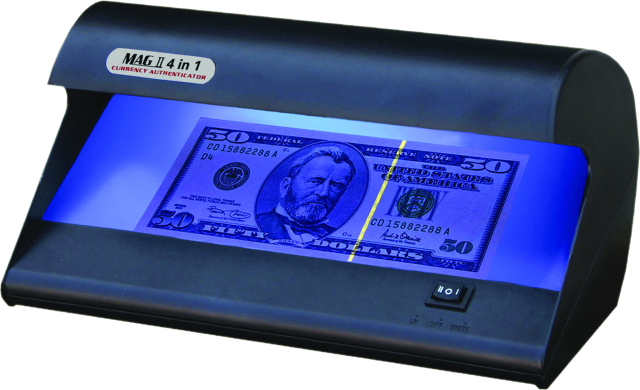 MAG II 4 in 1 Authenticators are the most economical and effective safeguards available to determine the authenticity of banknotes, credit cards, traveler's checks, IDs, and most driver's licenses. Both ultraviolet and white fluorescent lamps aid in the verification of features that are difficult or impossible to detect with the naked eye. The 4 in 1 can even be used in brightly lit environments, unlike most UV devices. It is the primary deterrent used by many leading Financial Institutions, Retailers, Government Agencies, and Hospitality Industry Firms. Simply Turn on the UV lamp to observe the UV-reactive imprints on most state driver's licenses, ID cards, all major credit cards, and traveler's checks. All returns subject to a 15% restocking/repackaging fee.